We apply the Laplace cascade method to systems of discrete equations of the form u i+1,j+1 = f(u i+1,j , u i,j+1, u i,j , u i,j−1), where u ij , i, j ∈ ℤ, is an element of a sequence of unknown vectors. 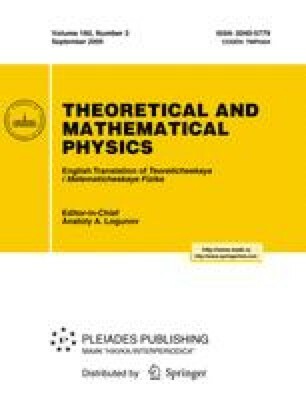 We introduce the concept of a generalized Laplace invariant and the related property that the systems is “of the Liouville type.” We prove a series of statements about the correctness of the definition of the generalized invariant and its applicability for seeking solutions and integrals of the system. We give some examples of systems of the Liouville type. Translated from Teoreticheskaya i Matematicheskaya Fizika, Vol. 160, No. 3, pp. 434–443, September, 2009.